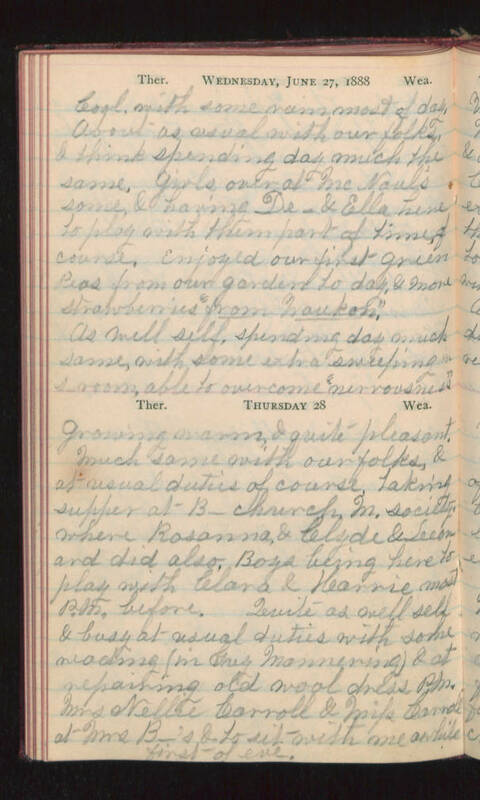 Wednesday, June 27, 1888 Cool, with some rain most of day. About as usual with our folks & think spending day much the same. girls over at McNaul's some, & having De- & Ella here to play with them part of time, of course. Enjoyed our first green peas from our garden today, & more strawberries "from Waukon". As well self, spending day much same, with some extra sweeping s-room, able to overcome "nervousness". Thursday 28 growing warm, & quite pleasant. Much same with our folks, & at usual duties of course. Taking supper at B- church M. society, where Rosanna & Clyde & Leonard did also. Boys being here to play with Clara & Karrie most P.M. before. Quite as well self & busy at usual duties with some reading (in Grey Mannering) & at repairing old wool dress P.M. Mrs Nellie Carroll & Miss Carroll at Mrs B-'s & to sit with me awhile first of eve.